I’ve decided to put Outlander by Diana Gabaldon on hold for now because I don’t seem to have enough time… So I’m currently reading only one book (it’s a miracle! ): Winter by Marissa Meyer. I have been looking forward to this read ever since I finished Cress, and so far it’s just as good as I was hoping for. Three finished titles this week; not bad at all! * I picked up Simon Vs. The Homo Sapiens Agenda by Becky Albertalli afterwards and I have to say I absolutely loved this read. I wish I had gotten a copy sooner, because this book is simply brilliant! * The last book I finished is The One Plus One by Jojo Moyes. I think romance fans will probably love this read, but I’m not a fan of the genre and thought part of the plot was quite predictable as well. I will start Melophobia (ARC) by James Morris as soon as I’ve finished Winter. I also want to try and read The Death Code by Lindsay Cummings so I can finish another series, and I have been looking forward to Between Shades Of Gray by Ruth Sepetys as well. (I might actually read the second one first because it’s been I while since I’ve read a book during WWII.) And my next TBR jar pick is still Where’d You Go, Bernadette by Maria Semple. This entry was posted in Book Memes, WWW Wednesdays and tagged alex gino, becky albertalli, between shades of grey, book memes, george, james morris, jojo moyes, lindsay cummings, maria semple, marissa meyer, melophobia, ruta sepetys, simon vs. the homo sapiens agenda, the death code, the one plus one, where'd you go bernadette, winter, www wednesdays by Yvo. Bookmark the permalink. It’s a shame you didn’t like The One Plus One but at least you tried something different. I can see how it would be predictable. If you ever feel like trying another Jojo Moyes read Me Before You. It did have a very pink fluffy cover but its content isn’t! The One Plus One was quite well written and not bad at all; I guess it was mostly my fault that I didn’t like it that much. 😉 I have Me Before You on my TBR pile so I will definitely read it at some point. 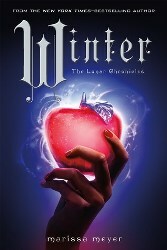 I’m glad you’re enjoying Winter, I really must start reading the Lunar Chronicles series very soon! I recently bought Simon Vs. The Homo Sapiens Agenda and can’t wait to read it, it sounds brilliant. I’m so glad you enjoyed Simon. I loved it! It made me really happy and I remember grinning uncontrollably for the last 40 pages or so. I’d love to find the time to re-read it. Winter is so good (if rather long). The only good thing about it being so long is that when it ends you feel satisfied and not too upset that the series is over! (although I’m thinking of starting a campaign for a Thorne spin-off series). Glad to hear Winter is going well for you! You have a great line up. I’ve been wanting to read Between Shades of Gray for awhile. I hear it’s fantastic. Enjoy!! I’m really enjoying Winter although I wish I would have more time to read… And Between Shades Of Gray has been recommended to me various times now and I always enjoy a good WWII story, so I’m really looking forward to that one as well. Have you read The Nightingale? Very little romance and a fantastic WWII story. Thanks for the recommendation! I have it on my wishlist but I still haven’t gotten the chance to get a copy… I will definitely try to get one soon. I’m enjoying Winter so far as well! 🙂 I adore Simon Vs The Homo Sapiens Agenda. Good to hear you like Winter as well! And Simon is definitely on my 2015 favorites list; such a brilliant story and I love Simon and Blue! I have a copy of ‘Between Shades of Grey’ on my shelf and I hope I get to it sometime soon, it sounds really good. Happy reading and thanks for participating in WWW Wednesday! I’ve heard a lot of great things about it, so I’m excited to finally start reading it soon. Happy reading and thanks for hosting! Where’d You Go, Bernadette by Maria Semple has been on my TBR too long hehe. i hope you’ll get to it soon. And me too. Happy reading! Hope Winter continues being awesome. I’m very close to being halfway through the book! OMG. That exactly the part I’m at! I just started chapter 37. Haha I just started chapter 36! I hope I can finish this book by tomorrow if I can get in a lot of reading time. We’ll see. I’m going to try and finish it before the weekend as well… Although I still have a looong way to go. I know. Some parts feel like they take so long. Not that it’s bad, just time consuming.